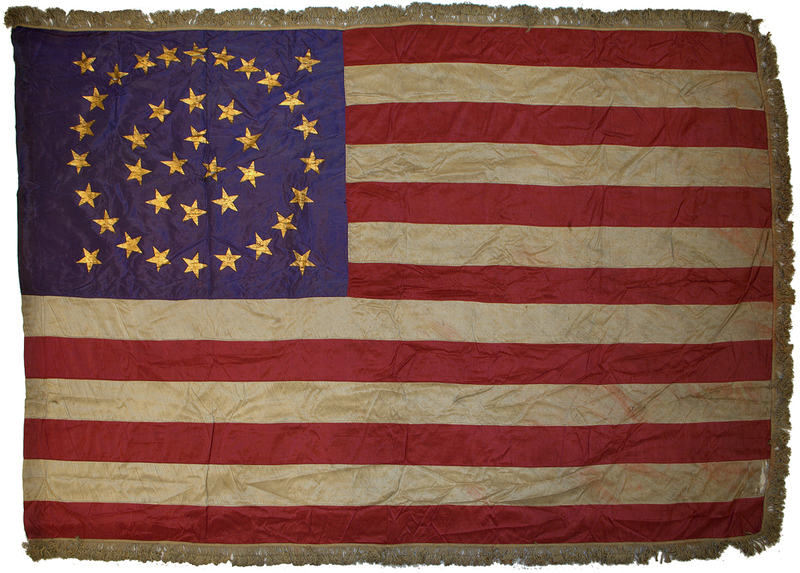 American military battle flags of the 19th century represent some of the most beautiful forms of the American Flag. Flags such as this magnificent example, made of silk fabric with gilt painted stars and fringe borders, represent the highest quality in 19th century flag manufacturing. Typically produced under contract to the federal government, flags of various sizes were carried by military units in the field and in parades and ceremonies. There are several traits belonging to this particular flag that make it an especially rare form of the type. Foremost is the star count of the flag. Thirty-nine star flags are considered unofficial, because the 39th state, North Dakota, was introduced to the union at the same time as the 40th state, South Dakota. Thus we immediately transitioned from 38 states to 40 states. During the 1875 period, prior to the introduction of Colorado, rumors of introducing another territory in addition to Colorado also prompted flag makers to produce 39 star flags, as they expected the total to change from 37 to 39. This did not happen, and we went from 37, which lasted for nearly 10 years, to 38, which lasted another 13 years. When considering this flag, it's uncertain whether or not the flag dates to circa 1875 or circa 1889. However it's my personal belief that it dates to circa 1875 primarily because of the interesting trait of having three center stars. Just as in the silk-and-gilt battle flag IAS-00151, where the manufacturer added 4 gilt stars to the center of the flag, bringing the total from 38 to 42, the maker of this flag most likely changed the design just slightly, from a traditional single-center-star medallion of 37 stars (circa 1867-1877) to this triple-star centered medallion. Though there may be others, this is the only medallion pattern flag that I've ever seen with three center stars, making it most likely unique. The outer wreath of 22 stars surrounds 13 inner stars (10 in the small wreath and three in the center). The flag is in wonderful condition for a flag of the period, and its canton color is a distinct and visually striking purplish hue. While printed parade flags in the count of 39 stars are somewhat common, pieced-and-sewn flags in the 39 count are rare in the extreme, with just a handful known, and of those, examples with star patterns other than lineal rows most likely number fewer than five. Consequently, this is one of the rarest and most beautiful known flags in this particular star count. Learn more about the fabrics used in flag construction.